If you stroll down Jefferson Street in Two Rivers, Wisconsin, you might pass by the Hamilton Wood Type & Printing Museum without even noticing it. Aside from a small awning printed with the museum's name, a few large wood blocks mounted to the outer wall, and some faded circus posters propped up in the windows, there is little to indicate that anything of interest lies inside the long, brick building that spans the length of the block. Once visitors step inside, however, they quickly find that appearances are deceiving. The front doors of the museum open to a cavernous room filled with antique printing presses and pantographs, machines that link a tracing arm to a router that cuts—in relief—alphabetical letters or other images into block of hardwood. Although presses and pantographs in the museum are from the late 19th to early 20th century, the process of letterpress printing dates back to the mid-15th century. Like most museums, this one has historical artifacts of interest. The difference here at the Hamilton Wood Type & Printing Museum is that these artifacts are used every day. Typography, the art or process of setting and arranging type and printing from it, is at the heart of the letterpress process. Every necessary character or image appearing in a printed piece—whether a newspaper, poster, book, or broadside—is crafted from wood or metal, set in a frame, inked, and pressed to the page by hand. Early letterpresses used both wood and metal-cast type; wood letters were used primarily for larger, bolder print jobs while cast metal or lead type was used for newspapers or pieces in which smaller print was required. It's a time-consuming process to be sure. But before there were computers with digital design and layout software, the letterpress process was the most efficient way to mass-produce printed materials. Amidst the bulky machines sit unlocked cases where visitors can handle the wood type blocks that contain individual characters—the letter "a," an ampersand, the number "1"—that are parts of series of similarly designed typographic characters called fonts. Larger hand-carved plates with words, phrases, and images are in neat stacks along the back wall, and rows of cabinets resembling old library card catalogs house most of the museum's vast collection of movable type in more sizes and shapes than you would have thought possible. But it's not all wood type and antique printing machinery that makes this museum special. Spotlights illuminate artwork hanging along the west-facing wall. Upon closer examination, it's clear these pieces are new prints made here at the museum. The whirring hum of a press from the printing studio—which is attached to the museum's main display room—echoes off the walls as artists and designers in residency complete projects that visitors can browse. Hanging from blue, chipped drying racks and assembled as collages on the walls, these new, hand-printed works reside amidst a variety of old movie and circus posters, signs, and pages from calendars. Seated behind a sleek desktop Mac computer is Jim Moran, the museum's archivist and only full-time employee. A veteran printer and typographer, Moran says that to understand how the museum got to where it is today, you need to know a little of the past of what he affectionately calls "The Hamilton." Tracing the history of the museum's large collection, Moran explains how The Hamilton's namesake, J. Edward Hamilton, turned the small fishing village of Two Rivers into America's leading producer of wood type. A transplant from Lockport, New York, Hamilton began his career working on a clothespin lathe and later honed his scroll saw skills by crafting ornate tables and chairs. His introduction to wood type came when Lyman Nash, editor of the Two Rivers Chronicle, needed some large, decorative type for printing posters for the Grand Ball at the city's Turner Hall. Without time to order a set from the East Coast, Nash asked Hamilton to create a new font. Hamilton sketched out a new font design, cut out the letters with a foot-powered scroll saw (this he did on his mother's back porch), mounted the type on blocks of wood, and sanded and polished the typefaces until they were perfect. Nash was impressed. By cutting 1/16-inch thick type from the wood of holly trees and gluing it to cheap pine blocks, Hamilton had created a process that cut the cost of type production by over one half. Following the success of his project for Nash, Hamilton found so much work cutting type that he created the J. E. Hamilton Holly Wood Type Company in 1880. Because of his low-cost type and his strategic acquisition of competing companies, Hamilton's factory in Two Rivers grew into the leading source of wood type by the end of the 19th century. While Hamilton's type enjoyed almost one hundred years of continual use, technology caught up with the printing industry during the 1960s and 1970s. Wood type production witnessed a sharp decline in demand, and, in the 1980s with the introduction of the Apple computer and subsequent digital print software, wood type was shelved for good. The Hamilton Company halted wood type production in 1984, and eventually the factory in Two Rivers was taken over by Thermal Fisher Scientific, a producer of fume hoods and lab equipment. Two Rivers Historical Society member Jim Van Lanen hated to see this piece of Two Rivers history disappear. Van Lanen approached Mike Brown, the president of Thermo Fisher, with the idea of creating a museum in the old Hamilton factory. 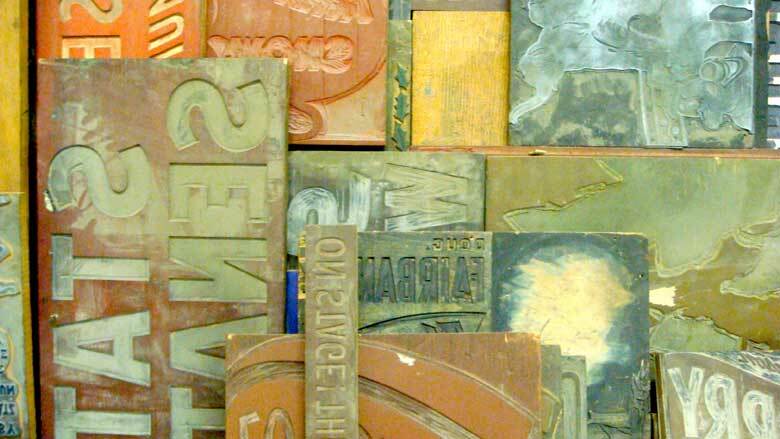 Brown agreed to donate the space, and in 1999 the Hamilton Wood Type & Printing Museum was born. Through the efforts of the Two Rivers Historical Society, the museum has amassed the country's—and, according to Moran, perhaps the world's—largest collection of wood type. Irving Silverman, the well-known author and philanthropist who began collecting type in the 1940s in New York, donated 1.3 million pieces—much of which he rescued from the scrap heap. Silverman is known as the "Grandfather" of The Hamilton. Other donations and acquisitions have increased the collection today to roughly 1.5 million pieces. When it first opened in 1999, an all-volunteer workforce staffed the museum. Although extremely passionate about preserving wood type as historical artifacts, volunteer staff knew relatively little about letterpress printing. Unlike a typical museum with special collections held behind glass cases, the Hamilton encouraged visitors to handle nearly all of the museum's wood type. Still, no one had the extensive background in letterpress necessary to run workshops with the presses. Some volunteers even nailed pieces to the walls as decoration, not considering that the type might again be used. Richard Zauft, a former graphic design professor at the University of Wisconsin-Milwaukee and the museum's original advisor, recommended that volunteers turn The Hamilton into a working museum and make use of the type. Zauft pointed out that these objects were built to last, noting how the edges of characters cut into the wood have withstood decades of printing without wearing or chipping and could probably last a few more. However, as the museum did not have a printer on staff, printing could only be done if a visiting teacher could demonstrate to his or her students how to use the presses or if an individual had experience using the type and equipment. Early on, there were only a few weeks of the year when visitors could find designers working the museum's presses. This changed with Moran. When he signed on as the museum's first printer in April of 2009, he shared Zauft's vision that one of the best ways to preserve the wood type was to use it. A third-generation printer, Moran got involved with the museum when he donated the presses from his family's print shop in Green Bay to The Hamilton in 2000. After seeing all the equipment sitting unused in the museum, he couldn't stay away. "There was way too much potential," says Moran. "I thought I'd hang around until they'd hire me." Eventually, The Hamilton did hire him as the museum archivist. Moran's brother Bill, a graphic designer in St. Paul, Minnesota, serves part time as the artistic director and only other employee. Volunteers from the Two Rivers Historical Society help staff the museum as well. Moran had a vision for turning the museum into something more: a center for the study of typography and scholarly research on letterpress and a worldwide destination for cutting-edge printers and graphic designers. In many ways, The Hamilton has become a Mecca for those with a love of typography. Groups from across the country—Chicago, Minneapolis, Seattle, New York—trek to the museum to archive and catalog type and participate in workshops and demonstration courses on letterpress printing. Designers in residency use presses to create new art projects, a variety of which can be viewed (and purchased) online on the popular DIY marketplace Etsy.com. The Hamilton also maintains a gift shop where visitors can buy numbered prints and artwork made at the museum. During his tenure, Moran has helped institute internships and 1- to 2-week residency programs (which he easily fills through word-of-mouth), workshops for artists in the use of hand-operated printing presses, and an annual printing conference called Wayzgoose, which this year will be held November 4 to 6. Although he has successfully transitioned The Hamilton into a working museum, Moran has not stopped pushing the museum into new territories. He has continued sorting and organizing type that had been donated and delivered in a variety of mixed states: Grecian fonts mixed with gothic, serifs with san-serifs, small-font metal type the size of a quarter mounded over wood block type the length of a forearm. Moran even has plans to create a widely accessible online type archive on The Hamilton's website. A group of graduate students from the University of Indiana in Bloomington is working with him to design a walking tour brochure for the museum, to be printed at the museum, which Moran says is nearly completed. "I never would have believed this [project] would be so big or interesting. People are curious about everything, fortunately," Moran says. "In the past, people stopped on their way to somewhere else. Now, we're becoming the destination." The Hamilton has seen an increase in foot traffic for a variety of reasons beyond Moran's tireless work. A plethora of DIY design blogs, national conferences, and an overall public desire for local, handmade goods, have contributed to the wellspring of interest in letterpress among younger generations of artists. To experience the Hamilton, however, one need not be a typeface junkie. Pointing to the brightly colored large-format posters that hang from ceiling and boxes of curiously shaped letterpress type, Moran notes that "you don't need to know anything about letterpress to enjoy the museum." Movie buffs will be drawn to the collection of block-printed theater posters from the 1920s to the early 1970s. Those interested in machinery and the industrial age can browse the collection of presses, linotype machines, and pantographs. Everyone can find something to love in the rotating gallery of prints from workshops sponsored by the museum and guest artists, currently featuring works from Bill Moran and Federico Cimatti of Buenos Aires' Prensa La Libertad. The museum's wood block type and antique presses tell the story of J. Edward Hamilton and provide a fascinating glimpse of print history. But with local and visiting artists creating new and interesting works daily and with the presses running more often than not, this museum is much more than a nostalgic stopover on the drive up to Door County. Today, through the efforts of Jim Moran and with support of the Two Rivers Historical Society, the Hamilton Wood Type & Printing Museum is a destination for art and design in action. Casey Thayer received an MFA from Northern Michigan University. His poetry has appeared in American Poetry Review, Crab Orchard Review, Smartish Pace, and elsewhere. A Madison resident, Thayer is an assistant professor of English at the University of Wisconsin-Rock County in Janesville.